Unfortunately, there are so much people who think that pasta ("dough" in Italian) and pizza are the only expression of Italian cuisine. You can go to restaurants in Finland which claim that they are Italian restaurants, then in the menu, you can not see more than pasta and pizza and a few barbecue "things". But the real Italian cuisine, especially around the Italian capital city, there is a huge and old tradition of offal dishes like Trippa alla Romana - Roman style tripe- tripe cooked in olive oil and tomato sauce-, Animelle -Sweetbread-, Cervello-Brain-, etc. Now there would be some people with faces changing and making sounds like "uuagghh, I can never eat brain!" etc. and they can try to make an offal-eating-person feel humiliated with stupid reactions like "ohh, how can you eat brain? It is not meat agghhh, you are disgusting!"... Well, to eat the muscle meats like arms or legs of an animal and try to humiliate offal-eating-people at the same time is just very immoral and ignorant, according to me. What I had tasted, ate and loved since my childhood, the offal dishes, are the most delicious and interesting meat products. Those people are just afraid of the smooth texture of these meats, otherwise, offal dishes are also just protein and they are also some parts of an animal. To eat meat, or not to eat meat, that is the question. Also, those people who try to look like disgusted when I say that I like offal, are the people who have never tried to taste any offal dish in their life. So, if you have not tasted, for example, any apple before, how can you say that you hate eating apple? Back to Italy, yeah, okay. So in Italy, if you go, I suggest you, of course, to try different kinds of pastas (=doughs). The pizza and pasta are served as a part of the starter idea in Italy, right after antipasti, if you skip antipasti and do not feel so hungry, anyway, just order a pasta dish and share with your friend, for example Amatriciana or Carbonara to taste the real one (of course not in a tourist restaurant, I will write about some restaurant reviews in this blog too). I call it "real" because in Finland, for example Carbonara is prepared with milk cream, which an Italian would never respect and eat, as Italians say. Unfortunately in Finland, lots of pasta dishes cooked with heavy creams in restaurants, which sometimes fit but mostly do not fit. A pasta with vegetables finished with a touch of cream and a drop of orange juice will be for sure delicious, as I had cooked when I was working as a cook. But our chef was cooking Carbonara also with cream, which actually should be prepared with egg yolks. To prepare a certain dish, there are basic elements that you can not change, if you change those elements, the dish is not that dish anymore, so a Carbonara sauce with cream and without egg yolks is not Carbonara anymore... Honesty, according to me, is the most important thing also in the kitchen, as it is in any part of life. See how blonde the Carbonara is... Egg yolks!!! 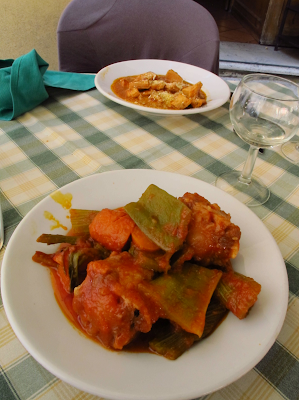 Then you should order a traditional dish like Trippa alla Romana-Tripe in tomato sauce- or beautiful soft pane-cooked brain pieces or sweetbreads, or Coda alla Vaccinara- Oxtail stew with vegetables, etc. to deeply understand the culture of traditional Italian dining. You can see a beautiful woman eating tripe or an Italian gentleman eating oxtail who is not using fork&knife but using his fingers, as it should be done with no shame. Because these people protect and internalize their culinary culture, it is not something to be ashamed for them as it should not be. So what I want to come up with, eating with fingers is an issue for the tourists. 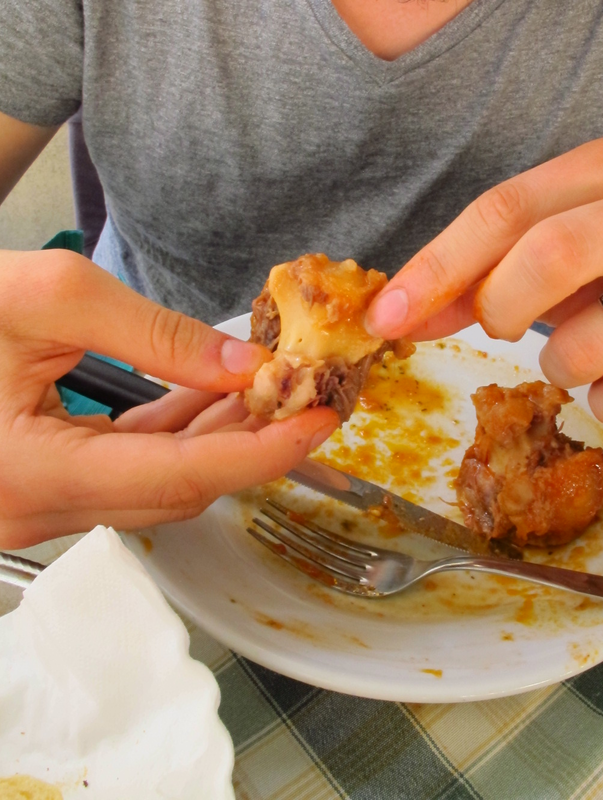 Use your fingers if you order a dish that should be eaten by hands, like Oxtail. If you try to eat oxtail with fork&knife, first of all, you will fail, that oxtail is full of bone and you will not be able to get the meat between the bones. Second of all, it is very rude and stupid looking, to try to show a "fake politeness". It would look very rude to eat a steak with fingers, so it is proper and polite to use fork&knife. So just the opposite way, for eating a piece of delicious oxtail, do not use fork&knife, the proper and polite way is, using the hands. That would be pizza too, do not feel embarrassed of eating pizza by using hand, you will see Italians eating around, using their hands and licking the oil on the fingers. This is the fun about dining! Also the Italian wines are some other master piece to talk about of course, a nice glass of Italian red will beat the strength of tomato sauce of your meal for sure. Or if you dont feel like wine, Italians make great beers. I have always liked the Italian wines, but I did not know that they can make great beers too. What about the restaurants and prices? I suggest no one to sit instantly in an unknown restaurant looking to a monument, for example, some restaurants facing through Pantheon in Rome. They are almost all tourist traps and just in the street behind, you can find the same dishes for half price. 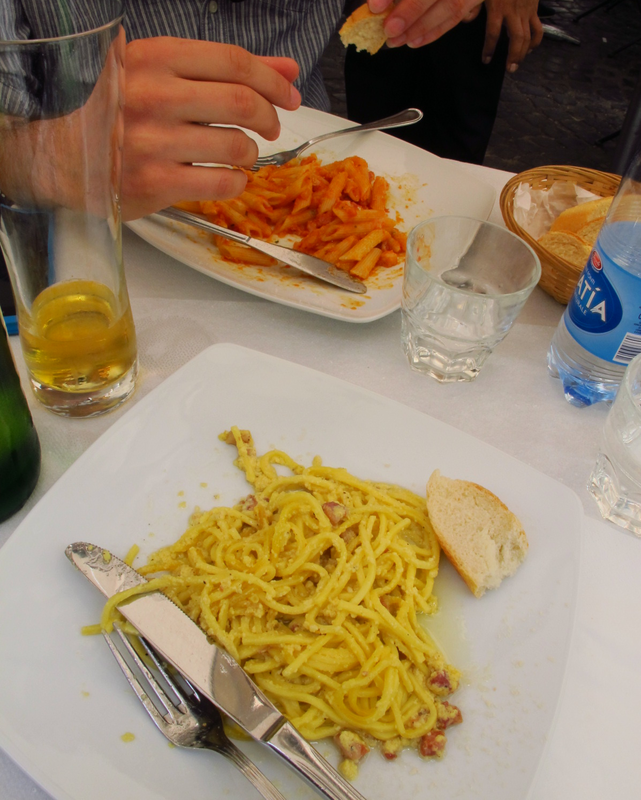 A pasta might cost between 10-15€ at those places, which is extremely expensive for Italy! Unfortunately the pasta dishes might cost between 13-25€ in Finland, this is the Finnish scale, but the pasta is a part of starter idea there and big portions of delicious pastas might cost between 3-7€ in Italy in a normal restaurant. If you do not believe how cheap it is, I had taken photos of some Menus, you can see down here. 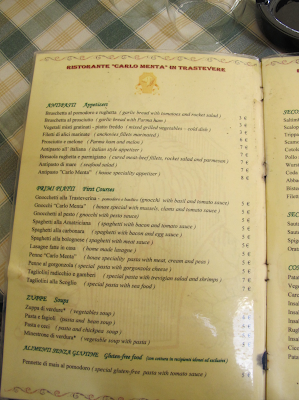 The main dishes might cost 5-12€ and the wines are extremely cheap, a bottle would be opened starting about 8€. So it is possible to find a very good quality wine to be opened for about 15-20€ in the wine list. Also, half size bottles are sold in the menus so you do not need to order a big bottle of wine if you do not feel like drinking the whole. The beer prices are 2-4€. Big size beer bottles are not 50cl, they are 66cl so one bottle is very enough for a couple. So, you can go to a restaurant, let`s say a group of 4, so you might leave after dining with a cost of 20-35€ per person including starter, main dish, dessert and a bottle, or, 2 bottles of wine for the whole group. I know, it sounds impossible for the Finnish point of view, but if you really know which restaurant you are going, it is very likely possible, as I experienced several times. 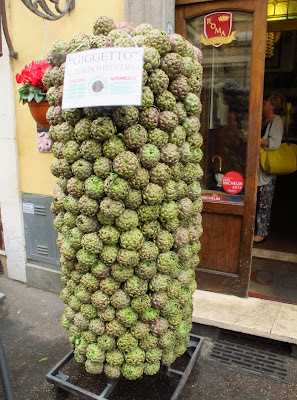 It is also another problem how not to be overcharged in Italy. I experienced and refused to pay a lot of times. It had happened as bills like added extra dish or dessert, or extra drink you had never ordered etc. Do not hesitate to resist against the bill and even be ready for a stressful argument. Dont worry about being polite, as it is extremely rude to cheat the customer in a restaurant. Also cover, service and table occupation fees are some other Italian things, it is stupid to pay cover-mostly the salt on the table- to pay service- if I want to feel like leaving tips, I can, do not charge me for it- to pay table occupation-where I will put my plate and eat my meal if I dont have a table-. But there are Italian restaurants which are not charging all of these or even non of these. I will write some restaurant reviews soon, but if you are already looking for a restaurant name to eat in Rome, then try Cul De Sac.